Marantz has gone all-out for its new DAB hi-fi. 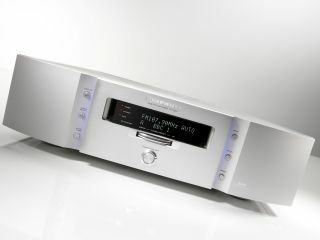 The ST-15S1 is a DAB, FM and MW receiver that comes brimming with the same technology Marantz uses in its high-end CD players. The ST-15S1 has 200 preset stations and a 24-bit/192kHz multi-bit digital-to-analogue converter for upping the signal quality, creating clearer sounds. It also contains a filter for clearing up analogue broadcasts, and both optical and coaxial digital outputs. It's a classic clean design, with a front Gyro Touch dial and what Marantz calls an 'easy to read' display. The ST-15S1 design involves a thick anodised aluminium front panel with a double-layer bottom plate and substantial shock-absorbing feet. All of which gives the ST-15S1 the potential to sound pretty special. Available now from specialist retailers, the ST-15S1 is priced £700.